I've been doing a lot of fly tying lately, some for my own fishing, and others to fill wooden fly boxes that are gifts for a couple of friends. There's nothing like spending an hour or two (or more) in front of warm fire on a cold evening tying flies and thinking about the days to come when you can tie one on the end of your tippet and tempt a trout or two. 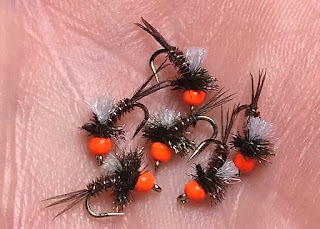 Here's a few Pumpkinhead Midges that have become a winter fishing must-have for me. 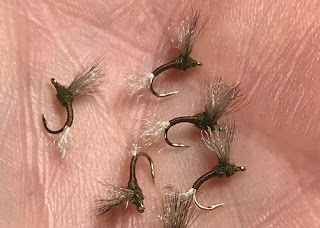 And here are a few Mathew's Blue-winged Olive Improved Sparkle Duns. This fly has been my most effective bwo pattern the past few years both here in the Northeast and in the Rocky Mountain trout streams. The more they get chewed up, the better they seem to work. Tied on a DaiRiki #125 in sizes 18-24 - these are 18's. Black and red Smoke Jumpers imitate midges and small mayflies well. I know a few guys that fish the Upper Delaware River system that love this pattern, especially when the trout get fussy. Recipe on the olive improved sparkle dun ? thanks ! I'm going to reach out to Tim Flagler and see if we can do a video on how it is tied over the holidays. This fly is awesome and its really not that hard to tie. First off, I'm glad you enjoyed your trip West over the summer! I moved from Corning, NY to Denver 2 1/2 years ago so I love getting your east coast info as well. Looks like you crushed them, to which I am not surprised. Love the improved sparkle dun pattern. I have a feeling the fish on the South Platte/Pan/Eagle/etc. are going to have a hard time refusing that baby come March! Thanks again for the amazing posts and sincere love for our sport. You and Tim have been an inspiration to me for years with your impeccable videos. Merry Christmas and tight lines my friend! 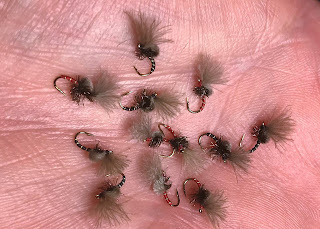 I can tell you that the pattern works great on the Eagle River when the olives are hatching. 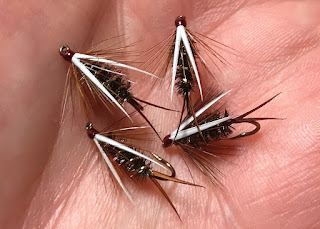 Look at my September posts this year and you'll see a piece I did - it was the only fly we used and we clobbered fish. Your improved sparkle dun tie is fantastic, professionally done. Any tying tips that you would like to share? And yes, a video by Tim Flagler would be greatly appreciated. Saw that the improved sparkle dun tutorial is up. Had started to tie up a few and as always picked up a few helpful techniques from the video. Much appreciated and am anxious for warmer weather to give this good looking pattern a try.